Ever wonder why the last one standing at the end of the tour is the Roadie? The Roadie X-Stream is the most versatile professional atmospheric effects generator available today. By incorporating Jem's X-Stream Airflow System, the Martin Jem Roadie X-Stream blends fog and air to produce a variety of effects; from an optically translucent haze to an immensely dense "white-out" of fog. On- board Independent smoke and fan control with timers and count down readouts. On-board 2 channels required for variable fog output and fan speed. 4x Eye bolts fixed on unit. 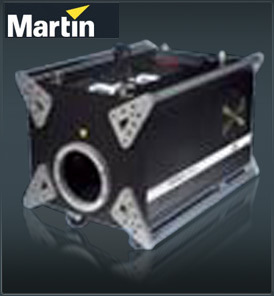 Now Jem offers the next generation of the Roadie, The Martin Jem Roadie X-Stream is a high powered industial specification smoke machine for long throw smoke projection.